Nobody does New Year's Eve quite like Austin. New York City can keep the ball drop and your local community center's bingo mixer is a rousing good time, but there's nothing quite like a night out on the town when you find yourself in a bustling city on the rise with the hottest parties on every corner. As you prepare to ring in 2019, check out a sampling of the wildest and most unforgettable New Year's Eve parties in Austin. When it comes to celebrating NYE the general rule of thumb is the wilder the party the better the night will be. Why not celebrate NYE of one of Austin's wildest bars, The Rooftop on 6th? This bar is known for having multiple dance floors and elevated platforms you can stand on to show your friends what moves you've got. With the purchase of your ticket to this event, you will get complimentary entrance to The Aquarium On Sixth, another wild bar on 6th Street right next to The Rooftop. Gather up a group of your best friends and dance your heart out at The Rooftop this NYE! Aquarium is hosting their very own 2019 VIP Celebration starting at 9 p.m. It's one of the hottest bars on Austin's famous 6th Street, in the heart of all the action! You'll receive complimentary entry to Rooftop the with your ticket and for an over the top experience, book a VIP table for your party. Come celebrate under the Big Top! Your ticket price includes VIP line bypass entrance and two drink tickets. There are table packages too! E-mail mgmt@unbarlievable.com. The alternative band The Black Angels will be performing at Mohawk Austin to ring in the New Year. Tickets will range from $35 for General Admission pre-sale to $60 for VIP. VIPs get priority entry to the show, a personal bottle of champagne, and a limited edition New Years Eve Black Angels Poster. Doors will open at 7 p.m. on New Year's Eve. Austin Swing Syndicate presents: A Red Carpet New Year's Eve. The Austin Swing Syndicate presents a night of Old Hollywood glamour at The Mansion to celebrate New Year's Eve in style. For $40, you can join in on the fun! Doors open at 7 p.m., and there will be swing dancing lessons at 8 p.m. followed by a performance by Dan Walton and his orchestra at 9 p.m. There will be light appetizers and desserts, a selfie station, and, of course, complimentary champagne to toast at midnight. There will be free parking available at The Quarters Garage. For the second year in a row, Moonfire Lounge in Austin will be hosting its Fire & Ice New Year's Eve Party! The party starts at 8:30 p.m., and tickets start at $45 with packages up to $1,200. There will be dancers and DJs to set the mood to count down to 2019. General admission cash bar ticket holders and VIPs will receive amenities such as special party favors, bottles of spirits with mixers, little bites, and more surprises. There will also be hors d'oeuvres and a champagne toast at midnight. Join the celebration at the Omni Austin Hotel Downtown as they bring the Roaring Twenties back to help ring in the new year! The celebration will kickoff at 9 p.m. on New Year's Eve, and there will be five hours worth of prepaid, open bar. The partying will take place across two floors with four areas to mingle, and there will be performances by three top-rated Austin DJs. There will be complimentary party favors, too! Tickets start at $109. Join the Goblin King at Elysium Austin for his fourth-annual New Year's Eve Ball. Doors open at 9 p.m. for this New Year's Eve party in Austin. There will be performances by three DJs and a labyrinth sing-a-long with a costumed cast. There will also be a special themed drink menu for you to peruse between dancing to music from the 80s, 90s and 2000s. This event will have a 21+ cover fee and tickets start at and pre-sale for general admission is $17 while pre-sale for VIP is $40. There will be a downstairs area that is VIP-only with exclusive entertainment! Celebrate New Year's Eve in Austin with Parlor & Yard! The event starts at 9 p.m. with an appetizer and late night buffet catered by Hot Mess plus complimentary drinks. There will be music performances by Boss Street Brass Band and various DJ sets. Early bird tickets are available until December 7 and start at $100. Have one last night to indulge those bad habits before the New Year's resolutions start! Head to the W Austin at 9 p.m. to celebrate one New Year Eve with two different parties: Vices and Virtues! The Vice Party contains Vice City, the opposite of Virtues with debauchery and excess, and each Living Room Bar is themed with a different vice. The Vice Party has a cash bar and tickets are $75. The Virtue Party, on the second floor, is all glamorous with gold and glitter. There will be music by CAPYAC and beats by Kid Slyce. Tickets for the Virtue Party are early bird general admission tickets are $150, and VIP tickets are $300. General admisssion tickets include drink vouchers, champagne toast and a midnight snack. If you want access to both Vices and Virtues, the Elite ticket is $375. From 6 p.m. to 2 a.m. there will be Devour in Trance. There will alsol be an expansive variety of food with everything from a quest fountain to truffle Bourbon milkshakes. Tickets for Devour are $75. At 10 p.m., SPiN Austin and ATX Sports & Adventures will host a New Year's Eve party filled with fun and games! General Admission starts at $70, and table packages are also available. Tickets include ping pong, food from the appetizer station, sparkling champagne to toast at midnight, and more. Music will be provided by DJ MRE, and the disco ball will drop at midnight! 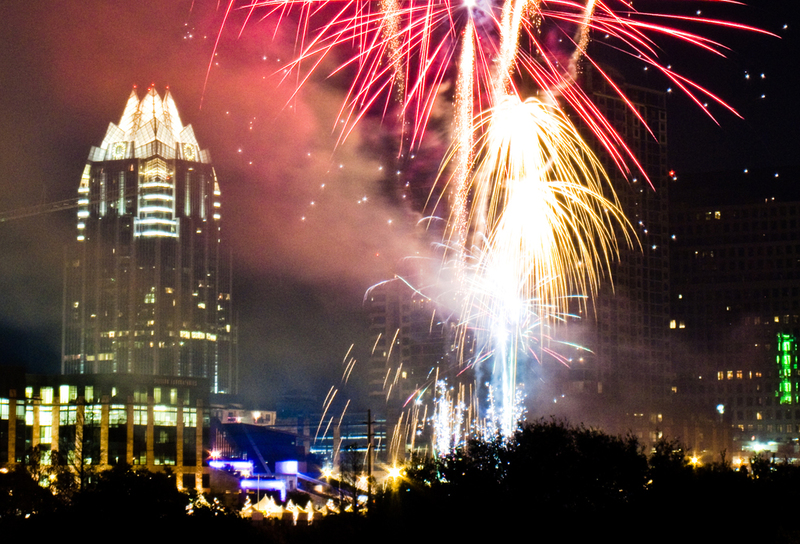 Wherever you end up going or whatever you end up doing, have a safe and fun New Years Eve in Austin! Connect with 512area today to stay in the know on all events happening in Austin area!